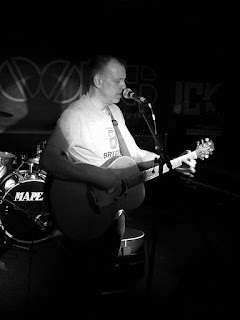 Returning to Scotland after a marathon set up here a couple of weeks ago, Tom Hingley continues to delight the faithful and win over new fans too. The Dreadnought is Scotland's longest running rock club, providing live music every weekend, playing host to new and established rock acts as well as the ever popular tribute band nights. Tonight sees a real mixture as former Inspiral Carpets vocalist Tom Hingley is in town, playing a well received hour long set before new local tribute band The Doors of Perception take to the stage. Tonight's set is an Inspirals heavy one - ideal for a Scottish Friday night crowd and gets underway with a delightfully stripped back Saturn 5. Find Out Why gets the 8:15 From Manchester treatment and sounds great. Despite performing over 100 shows a year, Tom Hingley never delivers the same set - or delivers the songs in the same way - twice and it's always intriguing to know want we are going to get. Tonight, Joe is a more slowed down rendition but maintains its anthemic quality before we are treated to some of Tom’s Blues Rock. As I've seen at many Tom solo shows, his blues material is always particularly well received by the appreciative crowd. Toy, one of the tracks released on last year's Record Store Day single with his Tom Hingley Band, is a revelation tonight. Stripped back and slowed down from the recorded rock n roll version, Tom’s soaring, warm, soulful vocals take centre stage. Hopefully this acoustic take will feature on his new album. Returning to familiar territory, She Comes In The Fall and Move are also slowed down and soulful. This Is How It Feels is triumphant before a storming punky I Want You concludes the Inspirals tracks on offer tonight. I Don't Want To Be A Fighter, arguably Tom’s finest solo song to date, ends the set and once again sounds heartfelt. With an extended, improvised outro, it is pleasing to see Tom working outside his comfort zone. Never afraid to take risks, Hingley is an endearing performer and we look forward to hearing him again soon.